Well, we did it… a super-packed, fun-filled weekend with no projects or yard work in sight! I’m sure we’ll be paying for it next weekend, the jungle is closing in on us. It’s a little scary. Although I’m not convinced that an “all play” and “no work” weekend is entirely good for us. By Monday we were all pretty much grumpy and tired. There must be a healthy balance between the two and that’s exactly what I’ll be striving for from now on. I’m spending the day today catching up: there’s a loaf of banana bread baking in the oven, the laundry has been sorted and started, and I’m about to tackle the bathrooms and floors. Nothing puts a smile on my face like the feeling of a freshly cleaned house, well, with the exception of a freshly cleaned house jacked up with flowers from the garden. I’m on sort of a theme here these days if you haven’t noticed. The garden is blooming and I just can’t help myself. We collect these little star jars—they are the packaging for dried beef. I only use dried beef in one recipe, but it’s a recipe that’s been in the family for years. What I’m trying to say is we have quite a few of these cute star jars. So I thought they’d be perfect to group together and use for the garden blooms. 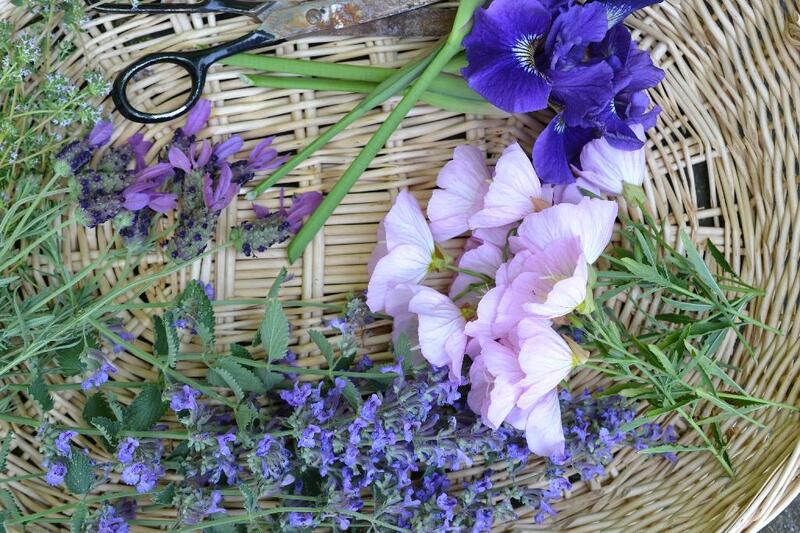 Between the laundry and baking, I went out back and snipped an assortment of herbs and blooms in pale pink and lavender hues. There’s not a ton blooming out there, but enough to muster up a little something. I grouped them together, mostly by type, and displayed them on the mantle for a fresh clean springtime look. After the crazy long weekend an empty clean house filled with garden blooms is like therapy to me. I’ll be rejuvenated and ready when they get back from the trenches. Not to mention we still have cool breezes blowing in, love that. A good day is all about working hard, getting things looking how I like them (which usually includes flowers this time of year), making a nice dinner, and unwinding with a cold beer at the end of a hard day’s work, a nice balance. I’m just about ready to start thinking about projects, more cottage plans, and yard work again. In the living room, near the fireplace, I’d like to bring in a more substantial chair, something comfortable. I’m thinking of a cute slipcovered number in the same fabric as our sofa. I just need to find the fabric and set everything in motion. I’m planning on using one of my grandpas old chairs (the only chair he ever sat in as far as I can remember), that will be the base. This entry was posted in seasonal decor and tagged cottage, decorating, flowers, garden, mantel, spring on May 27, 2015 by sally. beautiful! It is silly but I am so afraid to cut flowers from my garden. I am thinking of starting a cut flower garden in the back. We shall see. Banana bread with chocolate chip sounds sooo divine!!! Your fresh cut flowers look great in the jars on the mantel! I love that look. Much prettier than an expensive arrangement (to me). 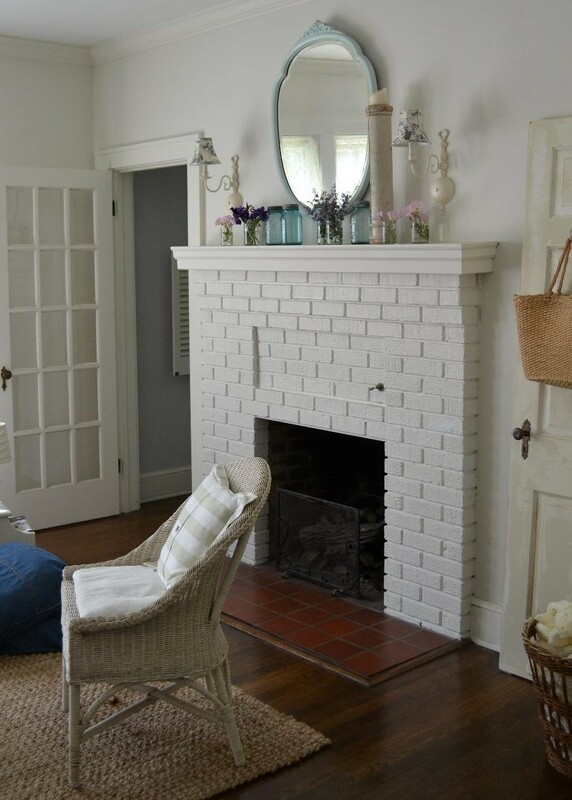 I love your painted brick fireplace too. 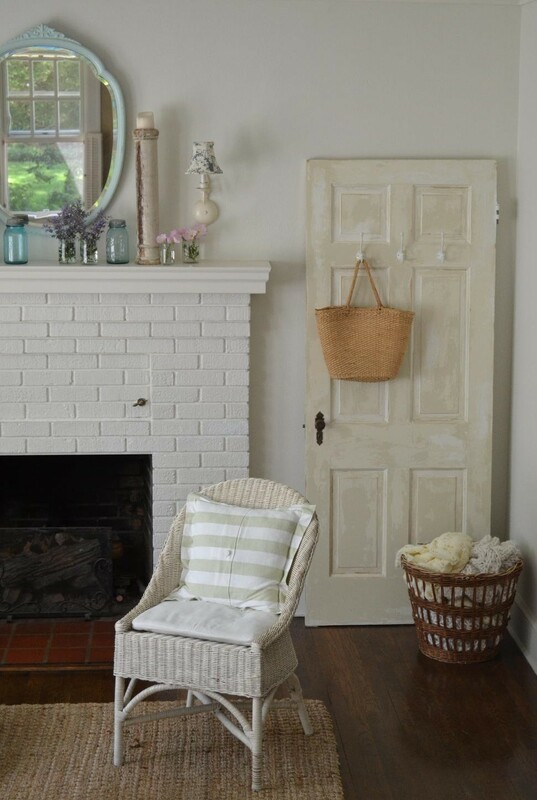 If I had a brick fireplace, it would be painted white like yours. I love that look! 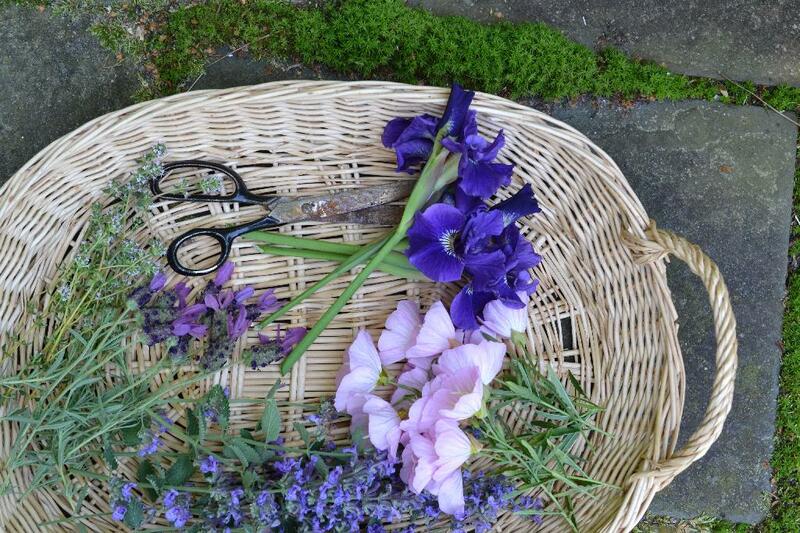 Ooh yes…nothing better than a clean house and pretty dainty flowers from your garden! 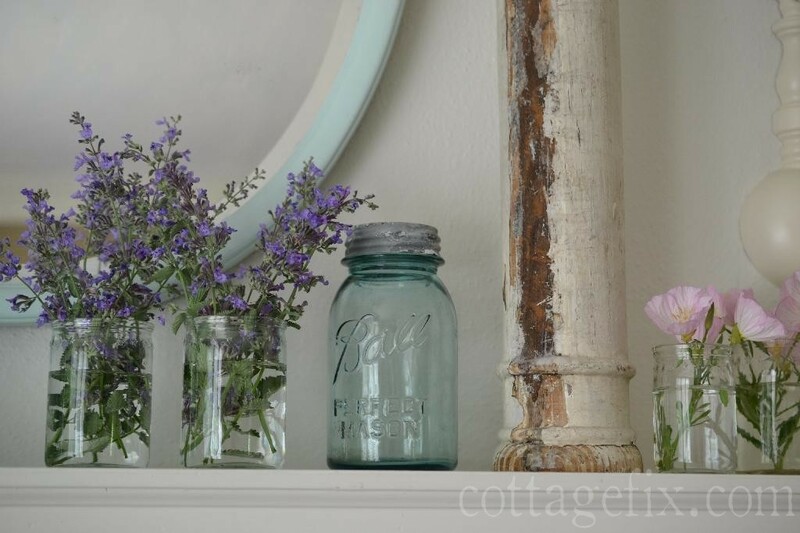 Love the little jars you’ve saved that make perfect vases on the mantel. And that banana bread sure does sound good about now. 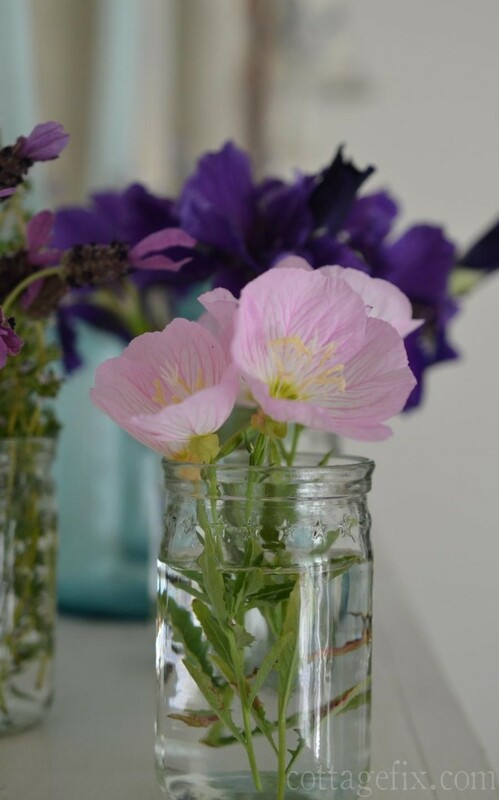 I love the use of recycled jars for vases. So pretty! Can’t wait o see what you have planned for future projects! Your house is sooooo pretty — I love to come here and get inspired 🙂 The way you arranged the flowers on the mantle is pretty, jars as vases are so homey looking. You might already know this, but if you strip the leaves off the part of the stems that will be under water it will keep the water cleaner and the flowers will last longer. Just a little tip. Your flowers are so pretty, thanks for sharing them! Thanks so much Karen! And thanks for the leaves in water tip. I like the way they look, but I didn’t know that they might make the blooms die sooner. Don’t like that!! Thanks for visiting and enjoy the rest of the weekend! Hi…….i’m new to the party..and i’m also on the east coast..MD’s eastern shore..it looks like i won’t get much done this morning..i see several older posts that look like i need to take a look..i too love bringing my garden indoors..and use whatever holds water doesn’t matter to me..i was laid up for a while once..pond remodel fiasco..and used an empty pill bottle..it actually looked quite charmimg..those little jars are WonderFul..do you buy the dried beef local or online..i’d love to get some..i look forward to having you visit my inbox..hope you have a nice week. 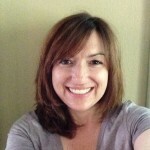 Thanks so much Wende! The dried beef just comes from any grocery store around here, its nothing special. The brand is ARMOUR and I use it to make Hot Virginia Dip in the colder months. Thanks for visiting!